Round Nose router bits help create decorative doors, drawer fronts and panels. These Whiteside bits feature a kickback reducing design and offer quality finishes paired with a long cutting life. 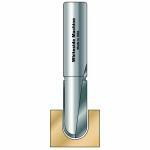 Choose from the available shanks and diameters below to add new Whiteside Round Nose Router Bits to your collection of woodworking tools today. 1/8" 1/16" 1/4" 2" 1/4"
3/16" 3/32" 3/8" 2" 1/4"
1/4" 1/8" 1/2" 2" 1/4"
3/8" 3/16" 1/2" 2" 1/4"
1/2" 1/4" 5/8" 2-1/4" 1/4"
5/8" 5/16" 3/8" 2" 1/4"
3/4" 3/8" 7/16" 2" 1/4"
3/8" 3/16" 1" 2-5/8" 1/2"
1/2" 1/4" 1-1/4" 2-7/8" 1/2"
5/8" 5/16" 1-1/4" 2-7/8" 1/2"
3/4" 3/8" 1-1/4" 2-7/8" 1/2"
7/8" 7/16" 1-1/4" 2-7/8" 1/2"
1" 1/2" 1-1/4" 2-7/8" 1/2"
1-1/4" 5/8" 1-1/4" 3" 1/2"
1-1/2" 3/4" 1-1/4" 1/2" 1/2"